The recorder displays current data directly on the trend screen. The user can watch a live recording or use playback to scroll through older data. Older data is displayed on the screen using chart memory. Chart memory holds what is seen on the screen and determines how far back playback works. The contents of the chart memory cannot be exported outside the recorder. Chart trends and memory can only be accessed on the screen or remotely, via a web browser. Chart memory is typically used for troubleshooting or checking the previous week’s batch data. 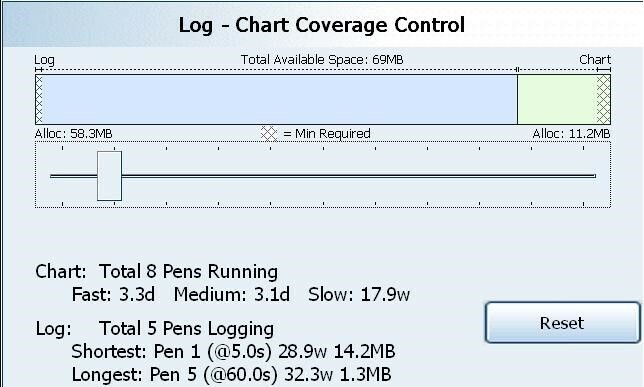 The way data is saved on a paperless recorder is through log memory. The size of the log memory determines how long data can be stored before the oldest data gets overwritten. The time remaining before old data is overwritten is displayed under the green triangle in the status bar. One situation that calls for a large log memory is when a recorder is put in a remote location, like a pump house. No one looks at the recorder screen because the sole concern is to archive data for environmental compliance purposes. Logged data is exported and viewed on a PC through the TrendManager software; it is not viewed locally on the recorder screen. If you want to be able to look for archived data from a year or two ago, you’ll need logged data memory. 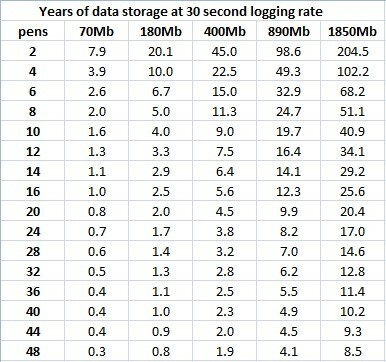 This table shows the number of years the recorder can hold data logged at a 30 second log rate (one point/pen/half minute). The numbers double for a one minute logging rate. 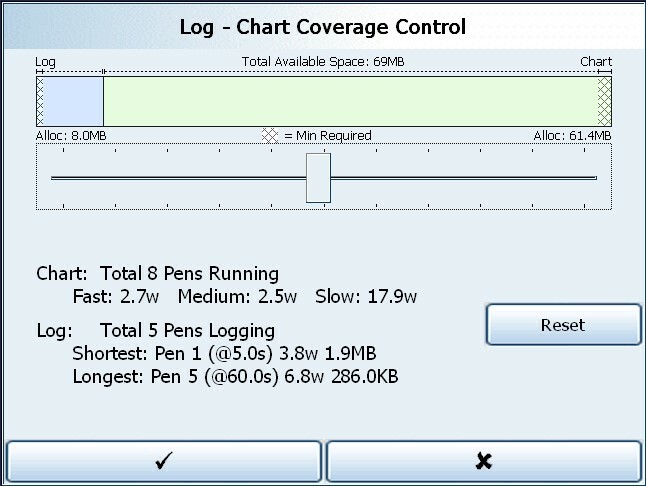 You can control how much of the recorder’s memory is allocated for chart and log memory based on your process and how you’re using the device. The memory allocation setup screen (below) shows exactly what the recorder calculates for the chart playback and total data storage times based on how the recorder is configured. Once the recorder knows how many trends it needs to save and what each logging rate is, it can calculate precise times. By moving the slider bar, you can change how the memory is divided between log and chart memory. “Chart” shows the length of time that the chart can be scrolled backwards. The time units displayed are d for days, w for weeks, and Y for years. Each trend chart has three different time scales, a fast (say 600mm/hr), a medium (60mm/hr) and a slow (10mm/hr) chart speed. Playback time for each differs. In the menu navigation bar, the memory allocation screen is called “storage bias” (menu > configure > setup > edit > recording > storage bias). Remember, data cannot be exported from the screen memory. Data can only be exported from the log memory. Just because you can see a trend on the screen, doesn’t mean you can get it out of the recorder. People forget to enable logging and get confused when they can see the data on a trend chart, but have no way to get the trend data out. Be sure to modify the recorder’s settings to best meet your application needs. This entry was posted on October 5, 2015, 11:07 am and is filed under Configuration, Honeywell, Paperless Recorders, Recorders, Trendview X-Series Paperless Recorders. You can follow any responses to this entry through RSS 2.0. You can leave a response, or trackback from your own site.